CATHEDRAL CITY, Calif. — If you're in Palm Springs and you're getting sick of Palm Springs golf — palm trees everywhere, lush green fairways and snowbirds galore - there is one quick way to pull off an afternoon escape. 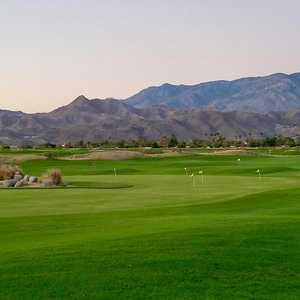 Cimarron Golf Resort throws plenty of quirky white sand in the golfer's way. Cimarron's Boulder course is desert in location, but almost links in feel. It's hard to imagine even the most beer-cart-fueled hacker thinking they're in Scotland. Considering the bright sun, the striking San Jacinto Mountains and all. Pull into the parking lot of Cimarron Golf Resort and play the locals' very different, borderline quirky golf course. You won't see a tree anywhere in sight. You will find yourself hitting out of plenty of weird, almost gravel-like sand traps that have as much in common with the rest of this Palm Springs golf region as Barbara Bush does with Madonna. Oh, Cimarron has the impressive mountains looming on the far horizon that seem to be a prerequisite of golf in the Coachella Valley. But there are also holes that play along a highway overpass that's about as picturesque as Toledo, Ohio. Welcome to Cimarron, the golf course that brings a little attitude to the pampering palms. If this is your only taste of Palm Springs golf ... well, the world should feel sorry for you. But that's not why you go to Cimarron. You come here for the great practice facilities, for the 18-hole executive course that's one of the best short courses in all of California, for the steal deals you can sometimes get and the affordable green fees always available ($65 after noon on the full course in the heart of the winter high season). Cimarron also had the hottest beer cart girl seen in three weeks of Coachella Valley golf. She wore an old-school plaid hat that fits in with the supposed links style of the course too. And if you don't think there are golfers making course decisions based on cart girls, you haven't been around many golfers. Cimarron isn't big on pretentiousness. You'll find that out by the time you get to the par-3 fifth. This is one of those holes running along the overpass. Spray it too far right and you'll end up literally in the shadow of the overpass, scrounging for your golf ball amongst some overthrown road trash. On this day, a few golfers had their dog trailing behind them on the course. Okay, you probably won't see that at Pete Dye's PGA West Stadium Course. But you're not getting on the Stadium Course for $65 either. Cimarron has its share of romance, too. There's a giant "Say I Do" arranged in grass letters outside the restaurant area for all the weddings held on site. Hey, this is a course where locals actually meet. Designer John Fought gives golfers some reasons to sweat even if they're not headed to the altar. This 6,858-yard par-71 track features enough of that white sand to make you feel like asking for a shovel at times. "Staying out of the sand is the hardest thing here," local Richard Hough said. "There are a lot of waste areas that can really trick up your game." From the first hole. Cimarron starts with a forced clear over a long sandy area to a fairway that's raised up on sort of a hilly ridge with more bunkers along the way. Some of Cimarron's bunkers are shaped like four leaf clovers dipping into a deep middle. You'd better bring at least a 56-degree wedge and expect to use it early and often. Cimarron isn't always beautiful. But it's usually interesting. Many times low-handicap players seem to actually enjoy Cimarron more. Not because it's exceedingly difficult - its slope rating is a tame 123 from the back tees. Rather, the better golfers are intrigued by the options Cimarron gives them. Like the choice of whether to really go for it on the short dogleg left par-4 eighth, or play it safe. "I like it because it's so different from most of the courses here," said Tim Hurja, a scratch golfer and PGA Professional who books area golf vacation packages as owner of Palm Springs Golf Central. "It tests your abilities in different ways." Cimarron isn't likely to be your favorite course in the Coachella Valley. It's not a course you have to work into a Palm Springs golf vacation no matter what. It can be a good change of pace - a knuckler thrown into a trip of fastballs. Don't expect Cimarron to remind you of Scotland and you will not be disappointed. That mantra — it's so links that it could be Scotland — is a painful disservice to the course done by marketing men. You're in the middle of the California desert. There are enough bulldozers, cement trucks and construction vehicles of all kinds to make a deaf man flinch. Cimarron is slightly more Scotland than East LA. That's how Scotland it is. With that, this is a great place to hang out. If you can't take the time to fit in a full course round, play the executive course, get a drink at the beer, hit on the cart girl. You won't be bummed. Unless you truly expected to land cart girl digits. You can find pretty much all the usual suspect fast food and chain restaurants nearby as well. But the place to go for a taste of your home in Palm Springs is The River shopping center. This is a cookie cutter outdoor mall on Bob Hope Drive with a unique setup. The place is centered around a man-made stream that runs down. When the weather's good, people often sit outside along "The River" and eat their meals. If you've ever seen a real river you won't be wowed, but remember this is the desert. Water's a big deal here. It is hard to beat La Quinta for an extravagant fantasyland getaway. There are 41 pools and 53 whirlpools spread out along this 45-acre celebrity hangout. You might be nobody, but you'll feel like someday here. Of course, it also may be hard for many to afford La Quinta. Keep an eye out, though. For those not trying for a once-in-a-blue-moon splurge, there are other semi-reasonable hotels in the Palm Springs area. In Palm Springs, this means hovering around $140 high season. Avoid the chains. Even the usual-budget joints charge over three figures here. You're better off looking for a bargain at one of the independent hotels or inns. One of the best is the Doral Desert Princess. There are 27 holes of golf literally in its backyard, nice mountain views and large comfortable rooms complete with balconies. Cimarron sometimes holds one-hour clinics that include a round on the executive course for the ridiculously cheap price of $15 after 1 p.m.